From Sacred Heart College in South Australia, Mark Naley made his SANFL senior debut with South Adelaide in 1980. He quickly established his reputation as a star state footballer, particularly impressive against the Vics on a number of occasions. He represented his state from 1981 to 1989, and again in 1991 and 1992. 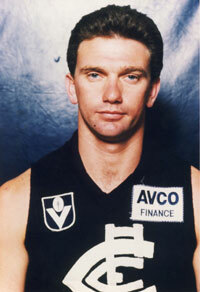 He was then recruited by Carlton, playing 65 games and scoring 74 goals in a successful VFL career between 1987 and 1990. His stay at Carlton got off to a slow start until he was selected for State of Origin duties by South Australia in 1987. He played a blinder in that game, and from then on was a star with the Blues. The undoubted highlight was the Premiership of 1987. One enduring memory of Mark Naley is of him wearing the long-sleeve number 17 guernsey (often with the sleeves rolled up), accelerating through the centre square and blasting through a goal from 45 metres out. Equally comfortable as a rover or at half forward, he formed a devastating roving partnership with fellow smalls Gleeson, Murphy, Evans and Bradley in the late 80s. Perhaps what set Naley apart from many who came to Carlton was his success both before, and after playing in the Navy Blue. He returned to South Adelaide in 1991 and won the Magarey Medal - an honour that was pre-empted by Footscray's attempt to draft him at number six selection in the '91 mid-season draft. But Mark was settled back home, and eventually played a total of over 250 games for South Adelaide before he retired in 1993. In honour of Mark's fine achievements at SANFL level, we have outlined those successes below. Mark Naley was to find out later in life that he was of indigenous origin. Contributors to this page: Bombasheldon , PatsFitztrick , molsey , WillowBlue , pblue , p(12)terg , true_blue24 , AGRO , Jarusa , Dukes and admin . Page last modified on Monday 28 of January, 2019 16:09:38 AEDT by Bombasheldon. 1982 GF - Hunter spoils Welsh & Jess.